Down Town: 120 Years of Downpatrick Shops – Last Chance to View! MIKE King, Curator at Down County Museum, said: “This very successful exhibition on the last 120 years of Downpatrick’s shops and businesses will close on Monday 5 November so anyone who hasn’t yet been to visit should make their way to the Museum to see this fascinating display on the town’s commercial history. 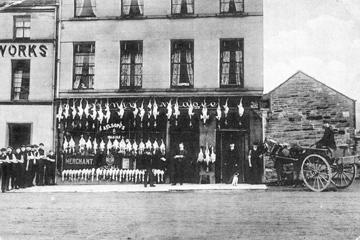 Henry Magee, family grocer in Downpatrick, around 1914 with staff. 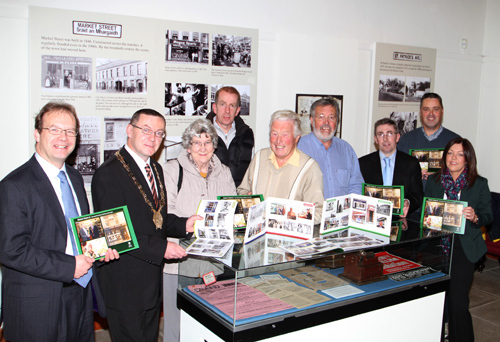 “The exhibition tells the story of how Downpatrick’s business history has developed over time and how the mercantile heritage of the town has contributed so vitally to the wider life of the community. “It is a story which includes radical new developments such as the arrival of the motor car and the railway (and later its loss), the television, the computer and the supermarket as well as the gradual changes that have taken place as businesses become established over time. It is a story which is still unfolding as commercial enterprises face into the challenges of these difficult economic times. The exhibition will remain on at Down County Museum until Monday 5 November. The museum is open daily from 10am to 5pm weekdays and from 1pm to 5pm on Saturdays and Sundays. Accompanying the exhibition is a book which is filled with a wonderful array of historic and contemporary photographs illustrating this theme. The book which is on sale in the museum shop costs just £4 and would make an ideal gift for family members at home and abroad. Down County Museum Curator Mike KIng with Down District Council Chairperson, Councillor Mickey Coogan, Connie and Martin Rourke, Fergus Kelly, Eddie McAllister, Councillor Patrick Clarke, Pat Cassidy and Tina Walker. at the exhibition on 120 years of Downpatrick shops.